This article is about the amiibo-based board in Mario Party 10. For Wario's board in the original Mario Party, see Wario's Battle Canyon. 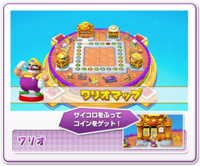 The Wario Board is a board that appears in Mario Party 10. It is available exclusively in the amiibo Party mode, where it can be played on when the Wario amiibo figure is scanned on the . Like the other amiibo boards, the Wario Board is based around a certain character, in this case Wario. The board takes inspiration from both major sub-series of the Wario franchise. The right half of the board is based more on the Wario Land series, while the left half is based on the WarioWare series. A Dice Block minigame can be played at the giant set piece at the top left quadrant of the board. When a player lands next to one of the chests, they can play a dice game to steal coins from other players, but it is possible that the player can roll an X and not steal any coins instead. When passing through by the area in the top-left corner, the player can obtain some coins by rolling some Dice Blocks. At the start of every round, the slot machine will be rolled, and the more Dice Blocks will be shown, the more of them the player can roll. The number the player rolls on each Dice Block shows the amount of coins they will get from it. If there are no Dice Blocks on the slot machine, nothing happens. After landing on the Event Space, the player gets a chance to steal some coins from their opponents by using special Dice Blocks which are hidden in a giant treasure chest. Depending on which corner the chest in, 1, 2 or 3 Coin-Steal Dice Blocks will come out. The character picture the player rolled on the Dice Block signifies the opponent which the player will steal 5 coins from. If they roll an "X" symbol on this Dice Block, it will be ignored and no coins will be stolen from anybody with this Dice Block. Wario Castle appears at the top left of the board, marking its first appearance since 2003's Wario World. The three chests are topped by different headgear that Wario has worn in his appearances. They are (in clockwise order) his hard hat from the earlier Wario Land games, his cap he wears in the Mario franchise and later Wario Land games, and his helmet from the WarioWare games. The music played on this board is an arrangement of the music heard on the Stonecarving City level in Wario Land: Shake It!. This page was last edited on May 28, 2018, at 20:32.